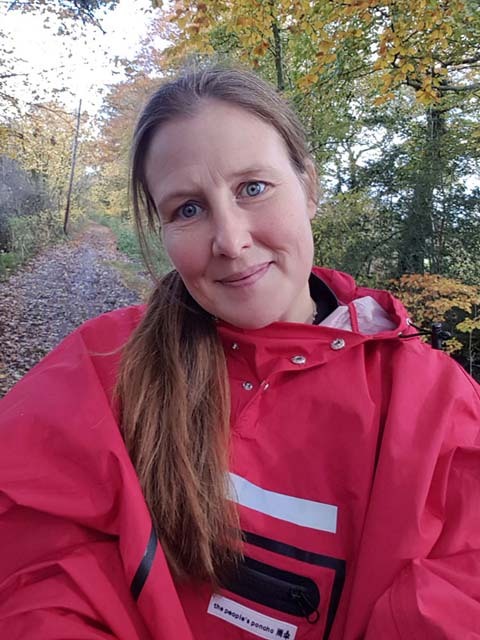 The poncho works well for autumn forest strolls! Photo: Nature Travels. The ponchos come with a handy carry pouch. Photo: Nature Travels. 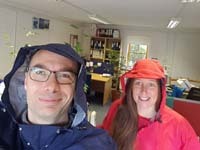 So how did our ponchos perform in the rainy Dorset autumn? There’s a zipped front pocket, front and back reflective strips and studs to secure under the arms. Photo: Nature Travels. There’s a zipped front pocket, front and back reflective strips and studs to secure under the arms. Now we admit, as there aren’t too many festivals happening in Dorset in October and November, we haven’t taken it to any festivals yet. But, I think this is one application where the People’s Poncho will excel. As mentioned, it’s lightweight and small, so no trouble to carry with you, and it’s perfect for protection from the rain when you’re not being too active, so will be in its element keeping you dry while listening to your favourite band at an outdoor stage. Plus, it can double really well as a picnic blanket or something to sit on if the grass is wet. We like the stiffened hood. Photo: Nature Travels. 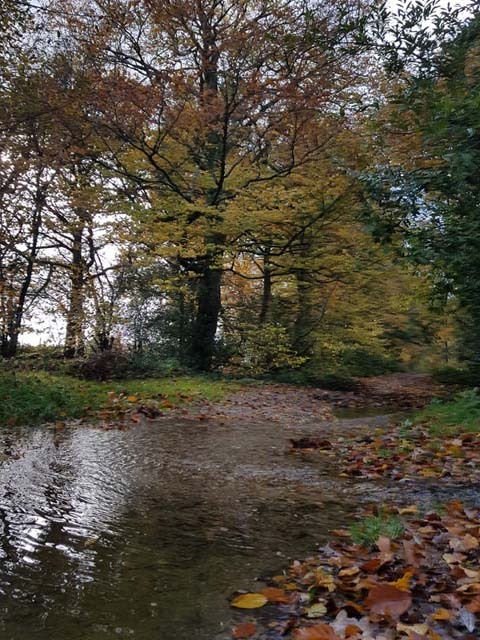 For walking, we’ve taken the ponchos on a few stomps through the Dorset countryside now. 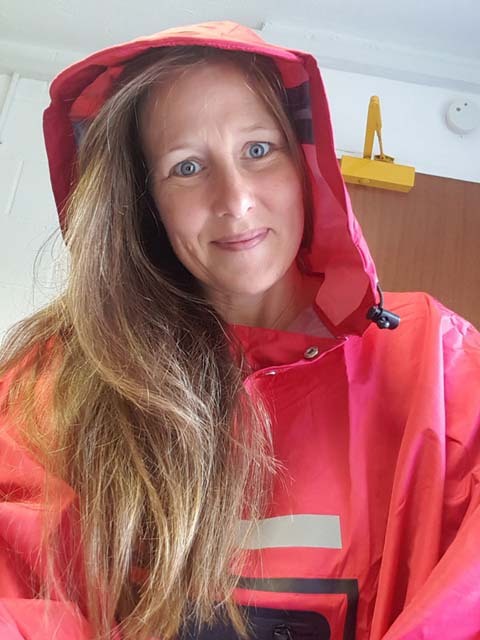 We found that for general walking, the poncho works well, especially if you’re expecting generally good weather but with a chance of needing some rain protection. Its small size and light weight means it’ll sit unobtrusively in your pack to quickly come to the rescue if the heavens open. If you’re not going to be doing any strenuous hikes, or if it’s not too hot (when you may get sweaty, as the poncho is waterproof but not especially breathable) or very cold (when you’ll probably want the extra thermal protection of a jacket), the poncho certainly comes in handy for general walking and outdoor use. It also of course has the advantage of keeping not only you dry but a small daypack too if you’re carrying one. For backpacking trips abroad, especially where you might only need rain protection occasionally such as for the odd tropical downpour, it’s also a useful item to have on your packing list and could have a number of uses. Getting outdoors in the Dorset countryside! Photo: Nature Travels. I’ve been trying out the People’s Poncho on a regular 30-minute cycle commute to the Nature Travels office. While there are definitely some good points, I do have some reservations about using the People’s Poncho for cycling. There are two loops under the front of the poncho which you can put your arms through to hold the poncho in place, and it then sits very securely while your hands are on the handlebars and covers your arms. Cycling with the People’s Poncho does have some limitations. Photo: Nature Travels. Most importantly, with your hands in the loops, you can’t make clear signals when turning as your hands are restricted to being a certain maximum distance apart from each other– the best you can manage is a little penguin flipper wave to the side with each hand. For this reason, I wouldn’t recommend having your hands in the loops when cycling. With the poncho stretched across the front of the bike in this way, you create quite a “sail” effect, which considerably adds to wind resistance, especially when there’s a headwind. There’s also the tendency for it to form a small dip in the middle between your arms, which then makes a bit of a puddle when it’s raining. You can of course cycle without your hands in the loops, and this leaves them much freer to make clear hand signals and certainly feels safer and less restrictive. But doing that tends to expose your arms below the elbows and provides less protection to your lower body, plus it tends to make the poncho more likely to flap about in the wind. Using it like this still has greater wind resistance compared to a jacket, which of course allows air to flow through between your torso and arms. 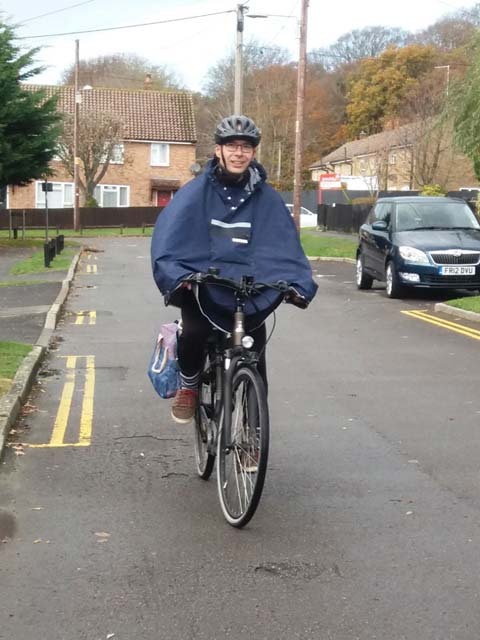 For cycling, I think the People’s Poncho could be a good choice for biking on cycle paths where you don’t share your space with cars and so making clear signals isn’t so important, or as a general back-up to have in your cycle bag or rucksack. If you regularly cycle on public roads with other traffic, or in windy conditions, I think you’re likely to feel safer and more streamlined using a jacket. 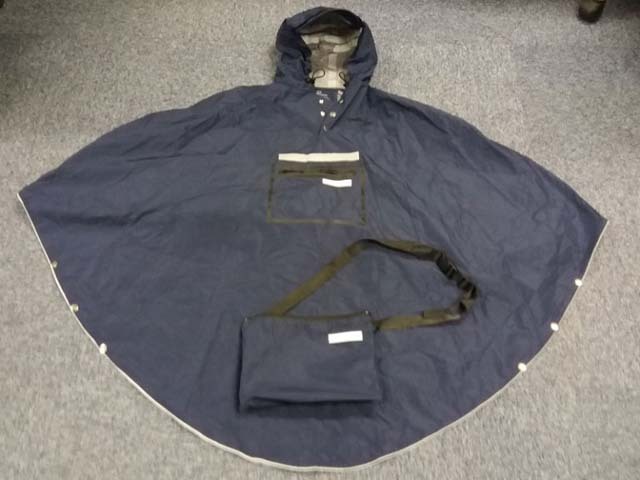 We like the ponchos and can see them getting regular use in the right situations – we’ll certainly be taking them to festivals next summer and on camping trips. It’s not going to replace your rain jacket for all outdoor activities – there will be times when a jacket will be more suitable – but it’s durable quality, light weight and compact size make it a worthy addition to your backpack for when it’s needed. 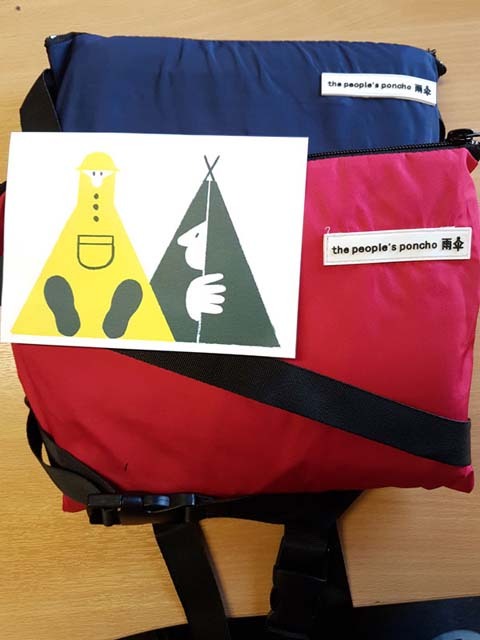 If you’d like a People’s Poncho of your own, they come in a variety of designs and colours, including children’s versions. Adult versions are around £65. See www.thepeoplesponcho.co.uk for details.